Pachrauta Nagarpalika, Benauli, Bara (Province 2) published vacancy notice for Health staffs. 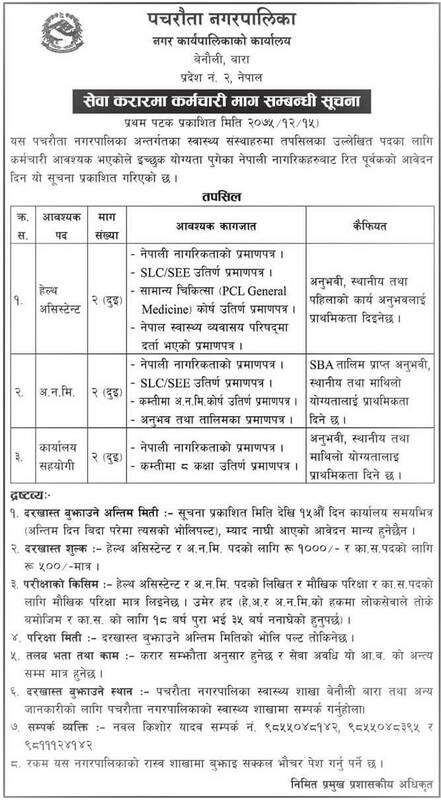 Qualified and interested Nepalese citizen can apply within 15 days from this vacancy notice published. Nepal Professional Health Council Certificate. Certificate of Working experience and Training. Candidate must have a Nepali Citizenship Certificate. Minimum 8 class passed certificate. Rs. 500 for Office Assistant (Karyalaya Sahayak). Oral Interview will be conducted on behalf of Office Assistant. Next day to the last day of application submission. Application Submission: Pacharauta Municipality Health Department, Benauli, Bara.